Where are you guys headed this Sunday? We're still figuring out where to go. I feel like going on another road trip somewhere. Our last road trip was on the first day of Eid Al Adha at the top of Jebel Jais mountain in Ras Al Khaimah with our friends and family. 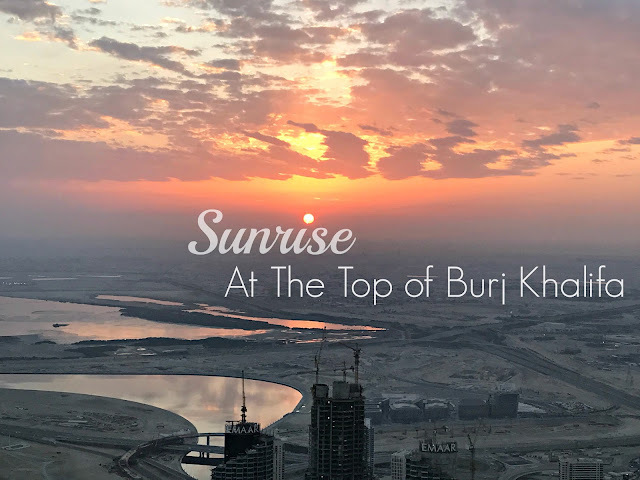 We left Dubai at three in the morning to catch the sunrise! 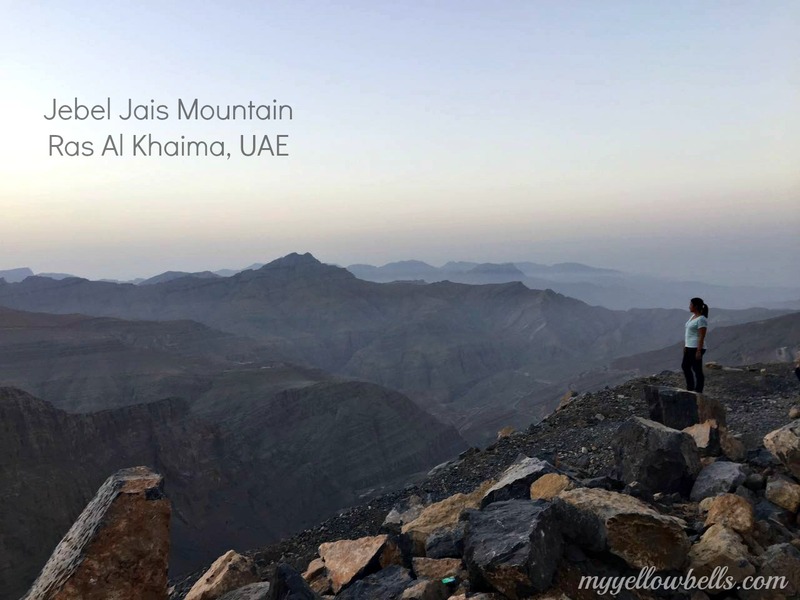 It was our first time to go to Jebel Jais. Clueless of how to get there, we used Waze-GPS Navigation app to find our way plus some help from our friends for directions. The travel time from our meeting place in Muhaisah to Jebel Jais mountain was about 1 hour to 50 minutes to 2 hours reaching the top by 5 am-ish. The road leading to the mountain top is one of the best in the world if not the best. Just be careful because it has a lot of sharp turns and there is no lamp post yet. There are also animals crossing like goats and wild fox like the one we saw. The weather was lovely, it was 10 degrees colder up there that day. It's snowed there last year during the winter months and that's what we want to see next time. Camping is also possible as there are designated stops and campsites with a roof. Just remember to bring inflatable beds and thick blankets/comforters to place under the bed if you are planning to sleep, the rocks are sharp and it might damage your camping gear. Regular mats are fine, however, seating won't be as comfortable. Folding chairs are a better option. Toilets are also available at every stop unfortunately, water supply could be insufficient. If your planning to go to Jebel Jais this holiday, please don't have second thoughts. Just go! You will never regret it. Bring the family, take the kids with you! They'll definitely enjoy it. Just watch and keep them close to avoid any mishaps. No, you need more company? Then bring the whole gang! It's one for the books! I promise! Want to see more of Jebel Jais story? Check out my friend Arence story here and Abigail story here! A full blown food truck craze has hit Dubai. Now we have them all in one place! Meraas call it (E11) the Last Exit. Because the new food truck haven is located in Jebel Ali near the last exit on Sheikh Zayed Road towards Abu Dhabi going back to Dubai. It's near Ghantoot, the border of Dubai and Abu Dhabi. You will be greeted by this pretty awesome pile of cars! We all need comfort food and sometimes my comfort food looks like this. Not store-bought nor delivered from any restaurants or fast food! Just a good old nesting roasted chicken - home cooked! Perfect, golden, plump roast chicken sitting on a bed of exceptional potatoes. Crunchy edges, fluffy middles, and gooey-sauce-soaked-bottoms. It's lemony-herby-garlicky delicious chicken! It is so flavorful! I received this invitation while I was on holiday in the Philippines last month and only get to try it out with the family the other day. Kimchikin is the first Korean fast casual restaurant in Dubai and it was their flagship store that we visited at Al Ghurair Center. It is a Korean fusion restaurant that brings Korean dishes with a twist to suit the taste of different nationalities that live in Dubai. It can get as authentic as Korean taste since they are flying most of the ingredients and spices from South Korea. Little Manila is celebrating their 1st Anniversary today, September 14, 2016. Happy 1st Anniversary Little Manila from us here at My Yellow Bells! To mark this festive occasion and make it all the more historic, Little Manila is officially launching today the biggest pizza in the UAE. A whopping 27 inches in diameter pizza with four different flavors - Pepperoni, Margarita w/ jalapenos, Hawaiian and Vegetarian. I was thankful to be part of the food tasting committee that Little Manila organized a few days ago and I can safely say that I am impressed, with the taste of the food, the service and the overall ambiance of the restaurant. Little Manila has come a long way since they've opened and they have drastically improve in all aspects of business. Priced at AED 360 only which is good for 10-12 pax inclusive of choice of pasta (carbonara or bolognese), 12 Buffalo Texas wings and choice of red tea or regular cola. Bring your barkada and be the first to try the biggest pizza in the UAE! The pizza crust is made of foccacia bread (a flat oven-baked Italian bread product similar in style and texture to pizza doughs), it is soft and chewy and everything that we love about foccacia bread. The toppings are fresh and cooked nice and even. The chicken is tender and juicy with just the right sweetness and zesty flavor. It comes in 12 whole wings, a very generous serving of buffalo wings. Both the pasta bolognese and pasta carbonara were cooked al dente topped with a generous amount of sauce. The pasta carbonara is rich and creamy with juicy chicken pieces with enough cheese to add saltiness to the dish. On the other hand, the bolognese was also delicious although I find it a little oily for my liking. Chef Jojo explained that the oil came from the three way infused tomato sauce. The cap off the food tasting event, the new Double Decker Choco Fudge Cake was served. It was indulgent, not too sweet nor bitter. If you've been reading my blog, you know that anything not too sweet is a winner in my books. The new Double Decker Choco Fudge Cake is available at the bread shop at AED 100/1 kg. You can ask them to write your message on the cake too. To sum it all up, our experience tasting the new addition to Little Manila's menu was a success. I personally liked the new dishes, not being biased here but because the food speaks for itself. Visit Little Manila today to join in the celebrations. If you are like me who missed the festivities in the Philippines, it is best to go there now. You will also be happy to find that Little Manila brought it's own jeepney and you can have your souvenir photo taken, its for free. We were at the supermarket last weekend and the blueberry, raspberry, and strawberry were selling cheap like 10 dirhams each pack so I bought a pack of each with a mixed berry smoothie recipe in my head. I should have grabbed more, I know, I hope they have more when we go grocery shopping this weekend. It is still very humid and hot outside and making a healthy drink from these berries is good for you, good for me, good for us all. It is high in antioxidant that removes toxins from the body. It is a simple recipe, you don't need to move a finger. It's a no-brainer, really. Throw in all ingredients to your blender, blitz on high, transfer to your prettiest glass. garnish with some berries you set aside to make it Instagram worthy, drink and enjoy! We brought ''tablea'' to Dubai for presents to friends and colleagues. We bought it from Taal wet market in Batangas while we were in the Philippines a couple of weeks back. We also kept some for ourselves to make hot choco drink and champorado for breakfast. Tablea are blocks of cacao molded into small discs or balls. The cacao beans are roasted, pulverized and molded into small disc unsweetened. There are sweetened ones too but I prefer the one without sugar. It feels weird that I never had hot choco drink made from "tablea" before. It might be a little late for Ferald to introduce me to tablea (abundant in his province in Batangas) even we've been married for more than a decade, (hahaha) but as they say, better late than never. Only when a friend requested for it as pasalubong that I was introduced to it. So I bought more. Now I'm addicted to it and how I wish I hoarded the tablea the lady was selling in the market. Good thing, my brother is still there and he can bring some more for us. The ones we got are simply wrapped in white paper with ten discs inside. The other ones I saw over the internet are in fancy wrapping but it doesn't matter anyway. What matter is what's inside, the chocolate itself and I couldn't be any happier to have it. But what I wasn't happy getting was a jet lag for an eight hour flight back to Dubai, 10 actually including the delays. I never knew what jet lag was. I think I never had it before until after our flight back to Dubai from the Philippines recently. I have all the symptoms of it, to the point I had to go to the hospital. I was nauseous and with continuous upset stomach, even my mood was messed up. The following day when I report back to work, my colleague and I thought of preparing the tablea I brought to the office and we made a hot chocolate drink instead of our usual afternoon coffee break. Little did I expect that it can make a difference. In the afternoon, my a husband greeted a much cheerful me. I felt it too, I became more cheerful compared to the previous days at work. It must be the tablea choco drink. You know when experts says chocolate makes you happy, well it's actually true, especially when it is as pure as this, and almost organic. I don't know the origin of the tablea we bought, who made it and how it was made. I'd like to check it out on our next vacation. So, how to make tablea chocolate drink? It's pretty simple. This recipe is for the three cups we prepared. We don't have the batirol so we just used a spoon. Simply add six discs of tablea to three cups of boiling water, make that three cups of fresh milk for a more rich texture, you may add more tablea if you want it extra thick. Add sugar depending on how sweet you want it. Boil and stir until all the tablea is dissolved. Serve hot and enjoy! There will be bits of cacao at the bottom of your cup, finish it too.